When you’re dealing with the aftermath of a kitchen fire, the damage isn’t confined to the heart of your house itself. The residue of oily smoke and the odor of melted plastics and synthetics are everywhere. You need to contact a professional company that can help you make it through a difficult time like this. As part of our fire restoration services, we take care of residential and commercial kitchen fire restoration projects across Chicago and the suburbs every day. We serve the surrounding communities from our headquarters located in both Chicago and Skokie, so we guarantee our arrival at your doorstep within 90 minutes of your call. Our crews usually beat that time. This type of fire often leaves holes in the walls and cracks in the floor. Our kitchen fire damage mitigation technicians repair and restore all infrastructure so that you can enjoy the heart of your home again as quickly as possible. We’re very proud of earning and maintaining our Preferred Vendor status with local and national insurance companies. 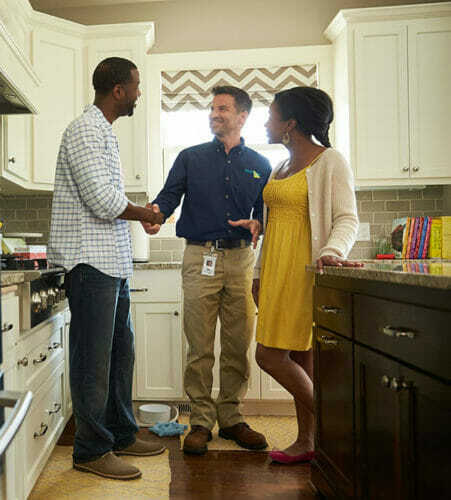 Our knowledgeable staff leverages that position to help you navigate the claims process. How Does Kitchen Fire Restoration Work? As soon as your call comes through on our emergency line, we dispatch our fire restoration teams. Our highly trained technicians arrive at your doorstep with state-of-the-art equipment and industry-approved protective gear so that we’re ready to start cleanup and restoration immediately. We assess the damage, develop an action plan tailored to your property and explain all details including our cost estimate. Smoke from a kitchen fire is very oily, and its sticky residue coats walls, ceilings and even the inside of your home’s HVAC system. We use specially formulated products to clean all contaminated areas including ductwork, and our techniques also eliminate lingering odors. Can you repair commercial kitchens after a fire? Yes, we can! We take care of commercial kitchen fire repair in restaurants, hotels, health care settings and more on a regular basis. How do you handle a kitchen fire restoration job? For detailed information about our work, please visit our process page. How do you treat fire-damaged furnishings and belongings? Our professionals use the very latest products and techniques to take care of your personal belongings. Visit this page for details. How much does kitchen fire restoration cost? No two kitchen fires are alike, so we can’t give you an estimate without first performing an inspection. However, you can get an overview of general expenses on our cost page. Does the process require special equipment and tools? We handle every project with advanced equipment backed by the latest industry technology. Learn more about our high-tech arsenal at our equipment page.